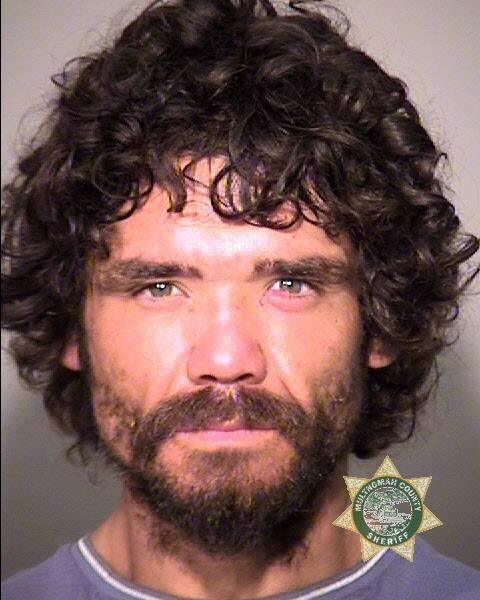 Joshua Castillo was charged with intimidation, menacing and trespass on Monday, Aug. 27 in Portland. A man allegedly armed with a knife has been arrested after police say he made threatening and derogatory comments about a woman's race. Joshua Michael Castillo, 33, was arrested on Monday, Aug. 27 on the corner of Southwest Park Avenue and Main Street in downtown Portland. Police say he approached the woman around 12:58 p.m. on the 1200 block of Southwest Columbia Street. Police confiscated the knife and say Castillo was arrested without incident. He faces charges of second-degree intimidation, menacing and trespass. Castillo has been living on the streets of Portland for at least 16 months after traveling to the area from Sacramento, according to court records. He was charged with second-degree trespassing earlier this month and possession of meth in January. His court record also includes two misdemeanor convictions and 39 instances of "failure to appear," according to booking documents. "It is apparent, from (his) actions, that (Castillo) is not willing to return to court once released from custody," one jailer wrote. The jail deputy said Castillo may have mental health issues based on his statements to police.